I travel. I run. I walk. I cycle. I trek. And then I come back on my blog to write all about my adventures! Back from a 6 days trip to two cities in China – Beijing, and Xian. The first word I had in mind after I finished my 7krun on an early morning in Beijing – CHAOTIC! Air quality? – Terrible! It’s smokey! Good thing I was only visiting! Hence the question – Why not just pick the hotel gym? …the good, the bad, the ugly – all on her feet – cruising through everything the city has to offer! And that one morning in Beijing was fantastic! As a 6 day visitor to a country I had been wanting to visit for a long time – I did not chose the gym as an alternative! I went out and took in all Beijing had to throw at me! Beijing is immense, aggressive, polluted, full of culture, predictable and surprising – all in a go! The heavily populated and smokey city has culture every 20 meters! You cannot miss it! It will constantly remind you – that you are in a different country! A dragon, a pagoda, the architecture of hotels, shops and the beautiful Tai Chi done on the streets will never let you forget that you are in the mecca of it all! Cars come in from unexpected directions and expect the right to go first! Most of the traffic signals didn’t work. Apart from the cars, there were bicycles, mini-motor bikes, mopeds, bikes coming in from all directions. Music is a bad idea! Take a look at this picture and imagine for yourselves what I meant when I said – Chaotic! I would believe parks are the only way to get by a run without stopping again and again at the traffic signals and not getting hit by some vehicle! That’s Beijing for you! The foreigner gets stared at – No Matter What! I got the looks from everyone on the road because Chinese people stare at every foreigner. I guess that stems from the fact that they are still a very closed society in some aspects. Men passed comments at me and women stared at me. The amount I got stared at I had to check if everything was ok with the way I looked! Xi’an City however was different! 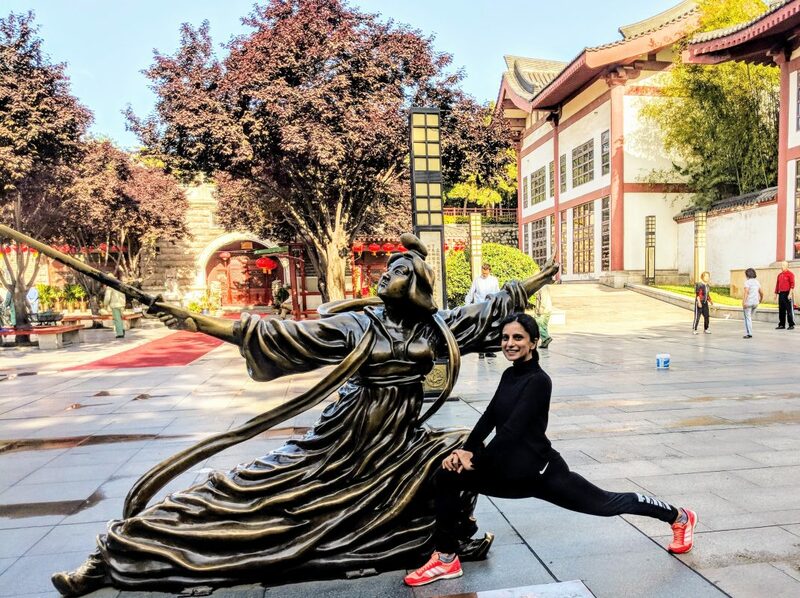 In Xi’an (you’ve probably never heard about Xi’an, but heard of the Terra Cotta Warriors – which is what this city is famous for and the reason I chose this city over the glass and metal – Shanghai) ran through a gorgeous green park where the morning was something people celebrated! Tai-Chi, dancing, the beautiful sport of Jianji etc. etc. had me in awe of the place. It was so hard to finish my 5k. The action was unmissable, worth stopping to look at, take a photograph and marvel at! It made me think about the crazy mornings back in Delhi, how they are always about mad rush, getting somewhere. Here are some pictures to make you get a feel of my morning. Maybe he is Confucious ! A regular park…in the middle of the city! He got conscious of me taking his pics and gave me some cool shots! …and look what I spotted in the middle of the city! Standing tall and strong just outside the ZOO cafe! I missed running on the famous Wall, despite having read DC Rainmaker’s review ! But I did get my time on ‘the wall’ when I went for a 6km walk on a beautiful rainy evening along with my friend, whose 40th Birthday celebration is what we came to China for! It was raining and beautiful. Apart from the two of us, there was ‘nobody’ on the wall that evening! The Tunnel that was the entrance and the exit to the Wall made for a very pretty picture at the end of the day!